Thank you for considering submitting an abstract for presentation of your work at the 2019 AAVLD Annual Meeting. According to a recent member survey, the quality of presentations in the Scientific Oral and Poster Sessions is the single most important reason for attending the AAVLD Annual Meeting. Thomson Reuters ScholarOneis the official AAVLD provider of online abstract submission and management services. If you are a current AAVLD member and have previously submitted an abstract, you can submit your abstract for the 2019 meeting by logging in to the AAVLD 2019 Abstract Submission Site with your User ID and Password. For non-members, or if you did not receive an email from ScholarOne containing your User ID and Password, follow the instructions on the website for creating a new account. After login, follow the online instructions to submit your abstract. We encourage submission of manuscripts to the JVDI based on your oral and poster presentations at the annual meeting. Manuscripts accepted by the JVDI editor after scientific peer-review will be published as refereed journal articles. Guidelines for format and style of manuscripts are published in the journal and on the AAVLD website (www.aavld.org). Authors are encouraged to submit manuscripts to the editor for processing prior to the meeting if possible. All award applicants must be the individual identified in the ScholarOne submission platform as the primary contact for the abstract. AAVLD Trainee Travel Awards: Trainees in a Master's, PhD or residency program enrolled in all disciplines in veterinary diagnostic medicine, including epidemiology, immunology, microbiology (bacteriology, food safety, mycology and virology), molecular diagnostics, parasitology, pathology and toxicology, are encouraged to apply. The $1,500 travel awards are intended to help defray the cost of travel and lodging to attend the AAVLD meeting. The Trainee Travel Awards are funded by the AAVLD Foundation and are intended to fulfill the recruitment and education mission of the AAVLD Foundation by encouraging trainee excellence in their diagnostic discipline, developing trainee presentation skills (verbal, written, organizational) and promoting networking of trainees with veterinary laboratory diagnosticians. AAVLD Laboratory Staff Travel Awards: Veterinary diagnostic laboratory staff in any discipline, including epidemiology, immunology, microbiology (bacteriology, food safety, mycology and virology), molecular diagnostics, parasitology, pathology and toxicology, are encouraged to apply. The $1,500 travel awards are intended to help defray the cost of travel and lodging to attend the AAVLD Annual Meeting. 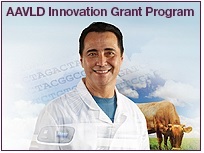 The Laboratory Staff Travel Awards are funded by the AAVLD Foundation. Laboratory staff travel awards to the AAVLD Annual Meeting are intended to encourage laboratory staff excellence in their diagnostic discipline, promote networking of veterinary laboratorians and encourage participation in AAVLD committees. AAVLD Graduate Student Presentations Awards (oral and poster presentations): The AAVLD encourages trainees in all disciplines of veterinary diagnostic medicine to apply. The purpose of the awards is to encourage trainee excellence in their diagnostic discipline and to develop trainee presentation skills (verbal, written, organizational). Two abstracts will be selected, and awards given during the AAVLD Annual Meeting, one for best oral presentation and one for best poster presentation. The recipient of each award will receive a $500 cash prize. The AAVLD Awards Committee will select the awardees and awardees will be announced during the joint AAVLD/USAHA President's Reception and Dinner during the annual meeting. AAVLD Laboratory Staff Presentation Award (oral and poster presentations): The AAVLD encourages lab staff in all disciplines of veterinary diagnostic medicine to apply. The purpose of the awards is to encourage laboratory staff excellence in their diagnostic discipline and to develop presentation skills (verbal, written, organizational). One award will be selected and given for best presentation during the AAVLD Annual Meeting. The recipient will receive a $500 cash prize. The AAVLD Awards Committee will select the awardee and awardee will be announced during the joint AAVLD/USAHA President's Reception and Dinner during the annual meeting. 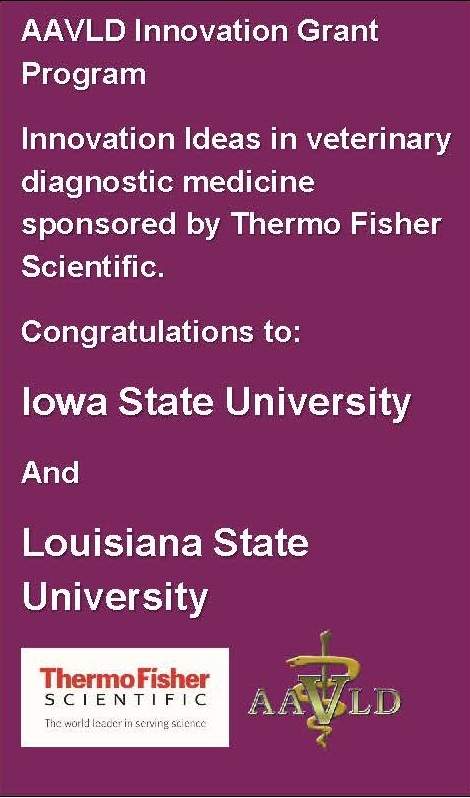 J. Lindsay Oaks Best Student Molecular Biology Award (oral and/or poster presentations): The AAVLD invites interested trainees to submit oral/poster presentations relating to molecular biology in veterinary diagnostics. This award for an amount up to $500 is given to the student delivering the best oral or poster presentation on a molecular biology topic at the AAVLD annual CE meeting. All molecular biology oral and poster trainee presenters are eligible. presentation on a bacteriology topic at the AAVLD annual CE meeting. All bacteriology oral presentation trainee presenters are eligible. Brenda Love Best Student Bacteriology Poster Award(poster presentations): The AAVLD invites interested trainees to submit poster presentations relating to bacteriology in veterinary diagnostics. This award for an amount up to $500 is given to the student delivering the best poster presentation on a bacteriology topic at the AAVLD annual CE meeting. All bacteriology poster trainee presenters are eligible to apply. AAVLD/ACVP Diagnostic Pathology Award for Residents/Graduate Students:The AAVLD and the American College of Veterinary Pathologists (ACVP) encourage trainees in veterinary pathology to participate in the annual meetings of both organizations. The AAVLD/ACVP Diagnostic Pathology Award for Residents/Graduate Students will be presented to graduate students and/or veterinary pathology residents for the best oral presentation in the field of veterinary pathology at the annual AAVLD meeting. Part of the award is to support travel of the award winner to the next annual ACVP meeting to present the award-winning presentation at the ACVP meeting. The awardee will receive $1,000 from the AAVLD pathology committee to help defray travel and lodging costs associated with attending the ACVP annual meeting of the following year. The award winner must present the award-winning presentation at the ACVP meeting of the following year in order to receive the award. The award will be given to award winner following submission of the abstract to the ACVP meeting. The recipient will be granted a waiver for the ACVP meeting registration fee. and follow the instructions. You may also access this information on the AAVLD website at https://www.aavld.org/aavld-usaha-annual-meeting and click the "Awards Page" tab. 1. DEADLINE: The deadline for submissions is May 24, 2019 at 11:59 PM ET. 2. SUBMISSION LIMIT: There are no restrictions on the number of submissions you may submit or on the number of abstracts you may present. 3. CHARACTER LIMIT: There is a limit of 3000 characters (approximately 400 words) for the text of your submission. The character count includes spaces. Your character count is displayed in the green bar at the top of your submission. The character count will not include title, authors, and institutions. 4. TITLE: Enter the title in sentence case (mixed case). Do not put your title in quotation marks. 5. BODY: All abstracts are required to be in 'narrative' form. You may copy and paste your submission into the appropriate fields. Typing your submission directly into the text box provided is not recommended as there is a 45-minute timeout period. Any work not saved within 45 minutes of inactivity will be lost. 6. PRESENTATION TYPE AND CATEGORY: Select the appropriate presentation type and category from the drop-down menu provided. Some submission types will have only one selection from which to choose. 7. KEYWORDS: Enter at least one (1) keyword. Up to three (3) keywords may be submitted. 8. AWARDS: Some submission types may be eligible for awards. Please indicate your interest by selecting the appropriate option. 9. AUTHORS: Please enter all authors in the order they should appear. If you (the Contact Author) are not the Presenter on a submission, you will need to provide contact information of the Presenter. 10. INSTITUTIONS/AFFILIATIONS: Enter all the institutional affiliations for your authors. 11. PROOF: Carefully check the proof of your submission. Make sure all special characters and formatting are displaying properly in your proof. If you find errors, return to the appropriate page by clicking on the page name in the left-hand side bar menu to make your corrections. 12. COMPLETING YOUR SUBMISSION: If you have not completed all required sections and details you will not be able to submit. When all required information is entered, the "Submit" button will appear at the bottom "Proof and Submit" page. You will be notified by e-mail that your abstract was received by the system upon submission. If you do not receive notification of abstract receipt by the system within one (1) hour, please contact technical support. 13. NOTIFICATIONS: Notifications will be emailed on July 15, 2019 If you do not receive your notification by July 31, 2019 please contact the AAVLD Program Chair. 14. SUBMISSION OR MEETING QUESTIONS: If you have questions regarding the submission criteria or questions about the meeting, please contact the Program Chair at [email protected].